I recently seized the opportunity to go to Canada for a period of 6 months to discover this beautiful country and take a little free time, think about my coaching activity and continue to learn a lot (I’m getting a formation to use hypnosis in my practice) in order to offer the best service to my customers. After my first 2 weeks, I decided to try new activities that I never would even have thought of (like yoga or pilates). I have also attended conferences, improvisation games and tried to fill all my weekends with excursions in the canadian nature. Act like a tourist in your own city! • Start by buying a travel guide from your region. Learn about the history of your city, your country, its traditions, its culture, its gastronomy. Find out about tourist attractions around you and you will probably notice that you know very little of them. You can also invite foreigner friends for a weekend, so you will feel obliged to show them around your city. • Keep an eye on events taking place in your city. Cultural calendars like eventbrite.com or even the “events” feature on Facebook allow you to inform yourself of everything that is happening around you. This is a great way to get out of your “comfort zone” because you will discover things you would never have been informed by your friends or by attending your usual places. • Act as if you have just arrived in your city and you needed to create a new social circle. Offer your colleagues a drink after work, be open to chat with strangers, try out every opportunity to meet new people. You can also attend networking events or use websites like meetup.com to participate in group activities. 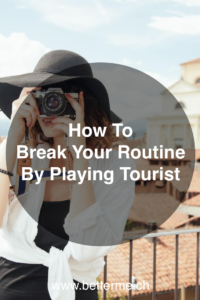 The word “routine” is very often negatively connoted but it’s actually something very structural which is necessary for our personal functioning. It would be very difficult for us to live without landmarks and to reinvent our daily lives every day. The problem is not the routine, but the activities that we insert in. That’s why I suggest a little exercise to help you shape your “ideal routine”. Imagine you’re moving into a country where you don’t know anyone and don’t have a job. What are the first activities you would like to set up? Think about all the areas that structure your life: social circle, employment, volunteering, sport, hobbies, culture, etc. The idea of being in a country where you don’t know anyone is also allowing you to press “refresh” on your past experiences and the image people have of you. Imagine that you are a perfect stranger to all the people you meet… what image would you like them to see and what would you like to tell them about you and your activities? Take time to imagine what your new daily life would be and compare it to your current life. What are the differences? What important areas do you currently neglect? Once the comparison is made, try to model your current daily life to your ideal one and act as if you had never met the people around you before. This will allow you to regain control of your life and erase the preconceived ideas that you or the people around you have forged over the years.